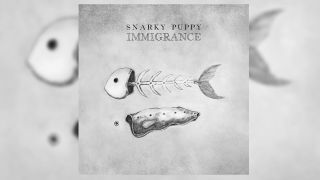 Snarky Puppy have announced that they will release a new album this March, and they begin their world tour in April. Following up their last album, 2016’s Grammy-winning Culcha Vulcha, Immigrance features bandleader Michael League as producer and is described as “rawer and moodier” than its predecessor. You can pre-order Immigrance here, and listen to new song Xavi below. Snarky Puppy will host the third annual GroundUP Music Festival on Miami Beach, FL on February 8-10. A full line-up and more info can be found here. After that, the group will then head to Los Angeles for a show at Walt Disney Hall Concert Hall with the Los Angeles Philharmonic on February 23. In April, Snarky Puppy will start their world tour – kicking off with Japan, Australia and New Zealand. A US tour will begin May 10, before they head to Europe for a headline festival tour from June 22nd to July 25. Full dates will be announced soon.